ATLANTA -- Seven student-athletes, including six high school seniors and one junior college player, have signed National Letters of Intent to play baseball at Georgia Tech next year, head coach Danny Hall announced. The recruiting class, assembled under the direction of assistant coach/recruiting coordinator Josh Holliday as well as associate head coach Bobby Moranda, includes four pitchers, two infielders and one catcher. Five of Tech's six high school recruits are ranked among the top 300 high school players in the nation according to Perfect Game USA. The commitments include AFLAC All-America catcher Torre Langley (Douglasville, Ga./Alexander HS), rated as the top player in the state of Georgia; pitcher Zach Von Tersch (Cedar Falls, Iowa / Cedar Falls HS), the top player in Iowa; shortstop Jeff Ussery (Hilton Head, S.C. / Hilton Head HS), the No. 2 prospect in South Carolina; pitcher Andrew Robinson (Senoia, Ga. / Starr's Mill HS), rated among the top 130 high school players in the nation; pitcher Will Hirsch (Suffolk, Va. / Nansemond River HS), ranked No. 7 in Virginia; and third baseman Patrick Long (Mechanicsville, Va. / Hanover HS). Left-handed pitcher Charlie Blackmon (Suwanee, Ga./Young Harris JC) will also join the program next year as a junior college transfer and will have two years of eligibility at Georgia Tech. 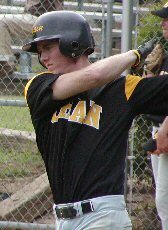 In addition, 1B/OF Tony Plagman of the Wesleyan School in Norcross has verbally committed to attend Tech in the Fall of 2006. Plagman entered his senior season with a .445 career batting average as well as 16 home runs, 87 RBI, 73 runs and 24 doubles. A first-team All-Gwinnett County pick as a junior, he was the only Class AA player on Junior Team Georgia in 2005. Other commitments have come from CF Matt Harper of Class AAAAA semi-finalist Lowndes County High School, OF Curtis Dupart of Woodinville, Wash., and OF Ben Baker of Starr's Mill High. "I am very excited about our recruiting class," said Hall. "We wanted to make sure that we had a couple of infielders in the group. We feel like we were able to get some very good pitchers to add to the guys that we will have returning next year. We are very excited about the guys that we have coming in." Blackmon posted a 7-1 record in 14 appearances as a freshman at Young Harris College, striking out 49 batters in 44.2 innings. He helped the Mountain Lions win the GJCAA state championship in 2005, and was named the MVP of the state tournament. Blackmon pitched for the Cotuit Kettleers of the Cape Cod Baseball league last summer, posting a 1-1 record and a 3.42 ERA in 26.1 innings. A high school teammate of current Tech pitcher Blake Wood at North Gwinnett High School, Blackmon has been drafted twice -- in the 28th round of the 2004 MLB draft by the Florida Marlins and in the 20th round of the 2005 draft by the Boston Red Sox. Named first-team All-Georgia Junior College Athletic Association in 2006. Danny Hall on Blackmon: "Charlie is a guy who was accepted at Georgia Tech out of high school, and he has already been drafted twice. He is a very talented left-hander and has a good arm. He is a very bright guy who has done very well academically. We see him as a guy that could contribute right away for us." Hirsch is rated as the No. 7 prospect in the state of Virginia and No. 221 in the nation by Perfect Game USA. A two-time first-team all-district honoree at Nansemond River High School, Hirsch recorded a team-high 81 strikeouts last spring. He helped his school reach the AAA Eastern District Regionals for the first time in 2005. Hirsch participated at the Perfect Game National Showcase and the Team One South Showcase last summer. Danny Hall on Hirsch: "The thing that really stands out is that Will has a great breaking ball. One of the things that you are always trying to find in college baseball is a right-handed pitcher with a great curve ball. He has one of the best that I have seen. He is a guy who is an excellent student and is interested in architecture, and it was a perfect match for us." "Hirsch to wear Yellow Jacket". See story. Named an AFLAC All-American, Langley is rated the No. 23 high school player in the nation and the top player in the state of Georgia by Perfect Game USA. Also ranked No. 38 in the nation by Baseball America. As a junior at Alexander High School in Douglasville, Langley hit .459 after batting .456 in 2004 and .411 in 2003. A three-time all-county selection, he was named county MVP in 2004. Langley played for the USA Baseball Junior National Team that won the silver medal at the 2005 COPABE "AAA" Pan Am Junior Championships in Mexico, batting .350 while ranking second on the team with 10 RBI in 14 games. He played on national championship summer teams with the East Cobb baseball program in 2001, 2003, 2004 and 2005. 2006 Update: Earned third-team All-America honors from Baseball America after hitting .633 with 15 homers and 55 RBI in 79 at bats as a senior....signed with Florida Marlins. Danny Hall on Langley: "Pound-for-pound, Torre Langley may be the best baseball player in the country. He is an excellent catcher and he has one of the best throwing arms that I have seen. His brother (Dustin) was a college baseball player at Georgia Southern. I feel like he's an excellent baseball player, and an excellent catcher. He is the kind of guy that could play a lot of different positions on the field because he is a very good athlete and a great competitor." Allan Matthews of Baseball America notes: "Though just 5-foot-8, Torre Langley has the makings of becoming a Gold Glove-caliber catcher. He delivers strikes to second base in less than 2.0 seconds and, while his receiving has room for improvement, he is agile and athletic, has good hands and blocks well." A three-year starter at third base, Long hit .567 with six home runs, 41 RBI and 15 stolen bases last spring as a junior at Hanover High School. He earned all-state, all-district and all-region honors while leading Hanover to district and region championships. Long, who hit .400 as a sophomore, played in the East Coast Pro Showcase last summer. Danny Hall on Long: "Patrick Long is a throwback player. He is a Pete Rose-type player, he will be one of the first guys to get his uniform dirty. He's a very aggressive and a very good baseball player. I would compare him to (former Tech second baseman) Adam Leggett, as a guy who is just a great, hard nosed player." "Hawks slugger inks scholarship with ACC power". See story. Robinson is rated as the No. 129 prospect in the nation and No. 11 in the state of Georgia by Perfect Game USA. He went 5-1 with 43 strikeouts and earned first-team all-county honors as a junior at Starr's Mill High School after going 5-1 with a 2.79 ERA as a sophomore. Robinson participated in the Area Code Games as well as the Perfect Game National Showcase. In the summer of 2004, he played on the East Cobb Braves team that won the WWBA National Championship. Danny Hall on Robinson: "I think that Andrew Robinson is a very good right-handed pitcher. He's a strike thrower with an excellent change-up and a good curveball. We're excited about having him in our program, and I think that he will be an excellent pitcher for us." Ussery is rated as the No. 254 high school prospect in the nation and No. 2 in the state of South Carolina by Perfect Game USA. A switch-hitting shortstop, Ussery was named to the USSSA all-tournament team in 2005, and also participated in the East Coast Professional Showcase last summer. In 2005, he completed his prep eligibility by driving in a team-high 25 runs to lead Hilton Head High School to the AAAA Region Championship and a school-record 22 wins. Ussery hit a combined .389 in his high school career. He has once again spent time during the spring of 2006 training in Puerto Rico. Danny Hall on Ussery: "Jeff is a premier athlete. He's a switch-hitting shortstop with outstanding speed and an outstanding arm. I think that he will be a guy who will join a long line of great infielders that we have had at Georgia Tech. He has the potential to be a great shortstop. He comes from an excellent family, and we're excited to have him in our program." "Ussery eyes Yellow Jackets". See story. Rated as the No. 1 prospect in the state of Iowa and the No. 144 prospect in the nation by Perfect Game USA, Von Tersch earned first-team all-conference and all-district honors last season at Cedar Falls High School. He struck out 48 batters in 45 innings and posted a 3.72 ERA as a junior, and went 3-1 with 33 strikeouts in 37 innings as a sophomore. Von Tersch participated in the Area Code Games in Long Beach last summer. Danny Hall on Von Tersch: "Zach is a very big guy, and we feel like he has a tremendous upside. Sometimes guys from the Midwest aren't able to get the pitching experience as maybe some guys who live in the South, but we look at Zach as a guy who could really explode in college." See 4/30/2006 video of Von Tersch's indoor workout at the Perfect Game Training Facility in Iowa.